According to Psychology Today Magazine, all group activities started to decline in the late 1980s, and have been in a free fall for the past five years. 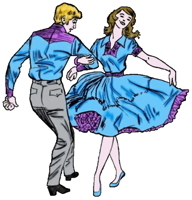 Bowling was once trumpeted as the model which square dancing should follow. Bowling, too, has been in a steep decline for the past several years. Why are group activities down? Staying at home has become much more popular. According to a Newsweek/Gallup poll, as far back as 1989, 70 percent of all adults said that staying at home is their favorite method of relaxation. In 1986 it was only about 25 percent. The number one reason for people staying home is because it is a safe haven from life's pressures. Many people in the 1960s and 1970s viewed staying home as a trap, an infringement on their freedom to discover and express themselves. Now it is a refuge from the pressured life and tough times outside. Also video cassettes and home computers have had an impact on the "stay at home" mentality. There is more emphasis on individual activity. Activities requiring only individual participation, such as crafts, using a computer, walking, and working out are all flourishing. Group activities are suffering. We have less leisure time. Americans are working more hours than ever before. The average worker is working six hours per week more than in 1973. People today want to experience a wide range of activities. This probably explain why the drop out rate is so high in square dancing after a year or two. The decline of square dancing in this country is not something that is easily fixed. Changes are needed. It is unlikely, no matter what changes are made, square dancing will never return to it's glory days of years past. West Texas Cowboy Square Dances, by Jimmy Clossin. El Paso, Texas, a book. Balance and Swing, an article. Ed Kremers Sr., an article. Foot 'n' Fiddle, a magazine. J. Tillman Hall, an article. Lee and Ruth Owen, an article. Mary Bee and Clayne Jensen, an article. Phyllis and Olcutt Sanders, an article. Rod and Helen LaFarge, an article. Roy and Libby McCutchan, an article. Square Dance in Film, a list. Square Dance Shorthand, a list. Square Dances by Bing Crosby, a book.